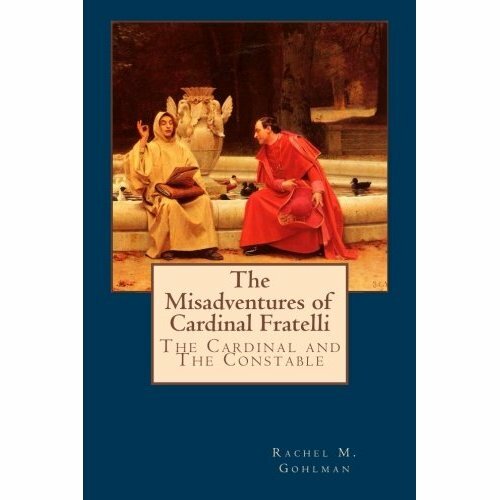 A new Cardinal Fratelli book is out! The fifth book of “The Misadventures of Cardinal Fratelli series.” A cardinal’s life is full of duties, documents, appointments and ceremonies, this young Fratelli knows well, and after a series of comical mishaps gets him to realize he’s being overworked, he decides upon a lovely vacation in Pisa to the south. He heads along the coast of Italy, reluctantly taking Gianni and several servants with him, including Jan, intent on soaking up the sunshine and lovely scenery. However, Fratelli soon finds that even vacations can be thorny as the friendly Archbishop of Pisa wants help with many things, Gianni soon lands himself in trouble and the pestered cardinal just can’t seem to get any time alone! Will Fratelli get the vacation he’s always wanted- or disaster? Avalable on Amazon and Kindle! Cardinal Fratelli’s Comments on Visiting an Average Catholic Parish. Our friend, Cardinal Fratelli recently traveled to the US. Taking the time to wander downtown incognito, ie. not wearing clericals, he visited an average Catholic parish for Mass. Here are his comments on the experience. – I settled in quite nicely. However, a woman’s low-cut dress offended my virgin eyes and a young man’s drooping trousers offended my intelligence. – I didn’t understand the opening hymn, Gather Us In. Who exactly were they calling “rich and haughty”? Why do we need courage to enter “the song”? Indeed, I would like to know what “the song” is. – At the invocation of the Holy Trinity, I was rather distracted by a person nearby who signed the cross very rapidly, as if he were seized with terror. – One of the altar boys curiously resembled a girl. – I could not smell any incense- they must have run out of it. – After the first reading, I said “Deo gratias” very loudly while everyone else said “Thanks be to God”. A few strange looks were sent towards me. – I waved to a little child and he threw his toy at me. – They provided nice, paper envelopes for our offering but I soon learned they were not made to hold coins. – At the Most-Holy Consecration, the priest turned his back to God which I thought was quite rude. – When chanting the “Pater Noster”, someone forcefully grabbed my hand and I felt violated. – An army of lay-people suddenly appeared at the altar, they took the hosts and chalices from the priest. I wanted to stop them but no one seemed alarmed. – I knelt to receive Holy Communion and was looked at strangely. – The choir sang beautifully but their incessant hymns after Holy Communion made it difficult for me to pray very well. – I don’t intend to fuss but I noticed some people departed immediately after Holy Communion. These should be taught proper manners. – For some odd reason, before the final benediction, there was a great deal of talk about confirmation classes, anniversaries, birthdays, raffles and bingo. 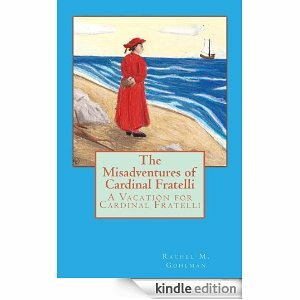 Just in time for Christmas, I published the 4th Misadventures of Cardinal Fratelli book on Kindle and Nook. The Misadventures of Cardinal Fratelli endure in this 4th novella of the series. Easter Season, the holiest season of the year, comes into full swing. Following the death of his Aunt’s father, Cardinal Fratelli prepares for his youngest cousin, Philomena’s arrival. He has trouble adjusting to this new resident who draws the eyes of many young men- including the son of the Duke of Tuscany! Meanwhile, the boy, Gianni, readies for his first communion. Michele, who is married to Fratelli’s brother, also prepares for something important: the birth of her first child. Surprises, mishaps- and party invitations, appear around every corner and Fratelli must balance being a pastor, a chaperone and a nephew as family dysfunction rears its ugly head! It is hilarious and well worth giving as a gift! **In case you are wondering why I’m not posting any Christmas stuff yet, I’m still waiting until we are further along into Advent. I know Christmas is about more than just buying things, it is centered on the greatest moment in history when God became man! When time stood still and the Almighty entered into earthly life. The precise answer to mankind’s cry for a Savior. Oh darn, I just posted Christmas stuff! Please consider buying my Cardinal Fratelli books for someone special this Christmas. Revolving around the mishaps of a blundering clergyman, they feature a light-hearted look at Christian faith, family and life. They are available on Amazon.com, Nook and Kindle! 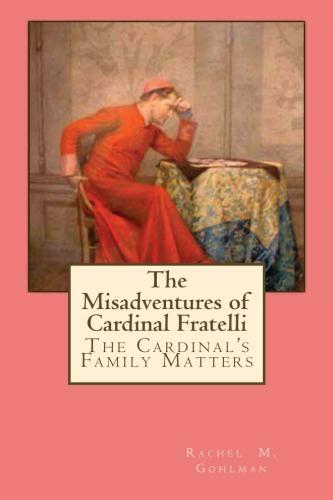 ^ This is the first volume, it introduces us to the lovable character of Cardinal Fratelli and shows us the little mishaps that occur every day as he lives out his priestly vocation. See how profoundly, a relationship with the Lord effects his life in meaningful- and comical ways! The second volume is all about Cardinal Fratelli’s plans for Christmas. Here, you get to meet his entire family and see their funny quirks. A strong message about the real reason for Christmas is also written into these pages. It is wonderful, endearing and hilarious! HAVE A MERRY CHRISTMAS AND A FUNNY NEW YEAR! I encourage everyone here to click on this link so that they will be treated to a wonderful experience. This is a project I am working on and will be contributing more to: The Cardinal Fratelli Picture Book. It features illustrations, done by Rachel M. Gohlman (myself) and Denita L. Arnold, of various scenes from the good cardinal’s life with beautiful descriptions for each picture. When it is fully completed, it will be posted on his blog. Please click on Cardinal Fratelli’s facebook page below to see the work-in-progress and enjoy it! 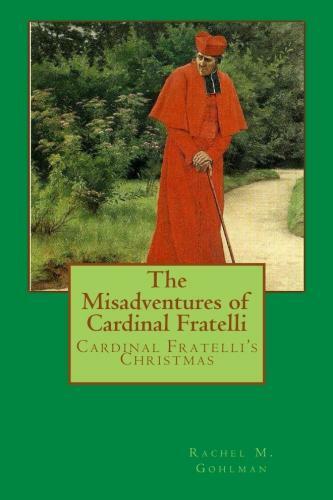 I would also like to remind those of you who are looking for a good Christmas present for a special person, that the first three volumes of the Misadventures of Cardinal Fratelli are out on Amazon.com, Kindle and Nook! Preparing for Mass is a wonderful thing, full of anticipation. I look forward to walking beneath dawn’s pinkish light, feeling the chill morning air and hearing bells announce the beginning of yet another day. However, some things I do not look forward to. There comes a time when the teacher must rebuke, when the shepherd must goad his sheep…better now than too late it seems. When I arrive, rapt in silent reverence to pray the holy liturgy, I notice some others do not share the same view. Some talk loudly on the steps, waiting till the last minute to come worship, others wander the transept as if having nothing else to do, and yet others arrive at holy Mass dressed more fitly for the taverns! Holy as I strive to be, I am still a man and not immune to carnal distraction. I will without fail notice when a woman approaches with her shoulders and neck exposed. At times, I feel glad that I face away during the most-holy consecration, that I cannot see bands of pale flesh when my mind should be on hallowed things! Shame on you who consider not clothing your daughters in modesty! And shame too, on you young men who present yourselves with wrinkled cuffs, messed hair, smelling of cigar smoke! It is not my duty to lay your dress out for you but if it were, I would teach a lesson in appropriate reverence! Elder ladies, I look upon you with dignity and respect. Your hair, greyed with wisdom, is a token for us all. But, some of you too have acted shamefully, gathering before the sanctuary after Mass to chatter and improvise daily plans. Have you no parlor or den to gather in? The sacred place isn’t for gathering but for adoration. You rich, you sneer at the poor who behave crudely then proceed to discuss hunting and cards in front of the altar rail! Go elsewhere with it all! Oh you florists and craftsmen, I admire your works but please do not sell them here! You eloquent speakers and idealists are dear to my heart but find a more suitable place to reveal your dreams. You gentlemen, who wear long coats, feathered hats and medals, can you cross the threshold before donning this finery? Thus it is written: “You shall worship God with reverence and godly fear for he is a consuming fire.” Even Moses, the greatest forefather, needed to remove his shoes when approaching hallowed ground. When you gather, be ever mindful that this place is unearthly, be mindful of the lamp of God’s presence, keep prayerful; stay silent. Sing with the harp of your voices at the entering antiphon, speak solely pure words here and only embrace your neighbor at the sign of peace. “We will go into his tabernacle: We will adore in the place where his feet stood.” (Psalm 132:7) Amen. 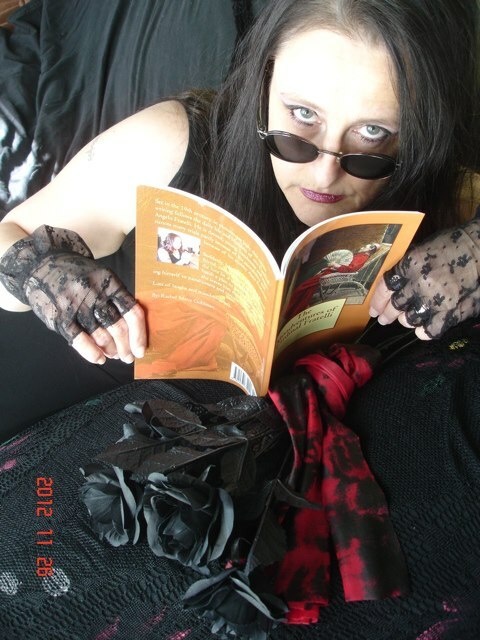 A fellow author has been caught reading my book! 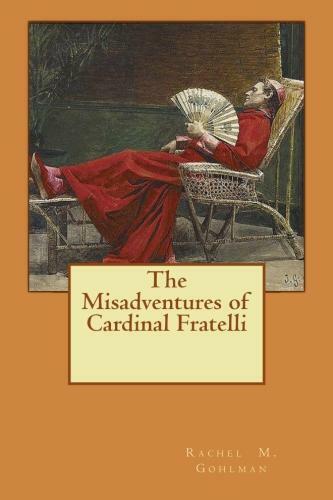 The third book of the “Misadventures of Cardinal Fratelli” series is now available in paperback. Unlike the previous volumes, this book combines a murder mystery with its comedic element. and trust me, Cardinal Fratelli is hilarious as ever! Afternoon sun flooded through stained-glass, soaking the cathedral floor with blue, yellow and magenta hues. Faint incense smoke still hung in the air. Birds chirped outside heralding springtime. Still softly grumbling, the cardinal walked beneath shaded trees and crossed a finely-kept courtyard. Calm set over him. Roses spread their petals towards the sun, vines crept upwards and a small, white bird bathed in the stone fountain at its center. Hearing human footfalls, it fled leaving a sprinkle of water behind. The cardinal wiped sweat from his forehead and entered into the welcoming shade of his small villa. Reminded of his irritation, he removed his shoes, shaking rainwater off them and took off his wet socks before stepping onto the carpet. Suddenly, he heard a sound. No answer. Quietly, the cardinal tiptoed down the hallway and peered into the parlor where a man’s shadow stood then moved about. He froze worriedly wondering if someone had trespassed into his house. Fratelli changed into clean garb, this time being very cautious about where he stepped. He paced down the hall careful not to don the wet shoes he’d just removed and instead, wore house slippers. They were old, well used; a dull-red and barely fit, yet were preferable to soggy feet. He and Arnold sat for some time sipping hot tea, enjoying the lazy afternoon and talking about various subjects including this wonderful weather. Then they switched to the topic of the cathedral and its parishioners. Silently, the two put their teacups down then dutifully headed for the office downstairs to sort through piles of paper and letters. Papers and such tended to pile up at the week’s beginning, sitting even longer since they had been gone all morning for prayers and Holy Mass. Arnold recovered Fratelli’s “Letter to the Faithful” beneath one of the piles handing it to the cardinal. He took it and sat down resuming his letter. After writing two more lines, he raised his head at a bird’s song. Beyond the arched window, a blue-feathered bird hops from branch to branch and keeps singing. Fratelli longed to be out there strolling amongst little creatures and taking in their beauty. The roses must be in full-bloom and wonderfully fragrant by now… However, he shook the lovely musings from his head and continued working. A few more lines were written. “They’re your faithful,” Arnold replied. The cardinal’s amber-colored eyes flashed with inspiration. Happy, he kicked up one leg like a young boy. Arnold murmured something about immaturity. Almost hearing, unsure, Fratelli asked him what he just said. An hour passed, significant work was done and Cardinal Fratelli nearly finished his letter. He looked up hearing horse-hooves upon pavement, seeing a shadow fall beneath the door. “Come in,” he said boldly. “Oh, yes…yes” he agreed standing. Instantly, Fratelli waved a hand at him. Once Fratelli left the room, Monsignor Barolo peered at Arnold inquisitive. “I wonder about that one,” he states.